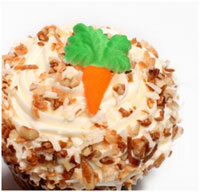 What would a recipe collection be without carrot cake cupcakes? 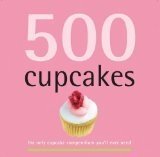 We didn't want to find out so here's our choice for the absolute best cupcake recipe of them all! Chock full of carrots, pineapple and raisins...these cupcakes will surely win you over! On waxed paper, combine flour, cinnamon, baking powder, baking soda, salt, and nutmeg. In a large bowl, with your mixer set at medium-high speed, beat eggs and sugars for 2 minutes until creamy. Beat in pineapple with its juice, oil and vanilla. Reduce speed to low and gradually add the flour mixture. Beat until blended. Fold in carrots and raisins. Bake for 25-30 minutes or until a toothpick inserted in the center of the cupcakes comes out clean. Immediately remove cupcakes from the pans and cool compleely on wire rack. When cupcakes are cool, frost with your favorite frosting.